Please note that clear PVC pipe has a slight blue / grey tinge to it and so should not be expected to be 100% optically clear. 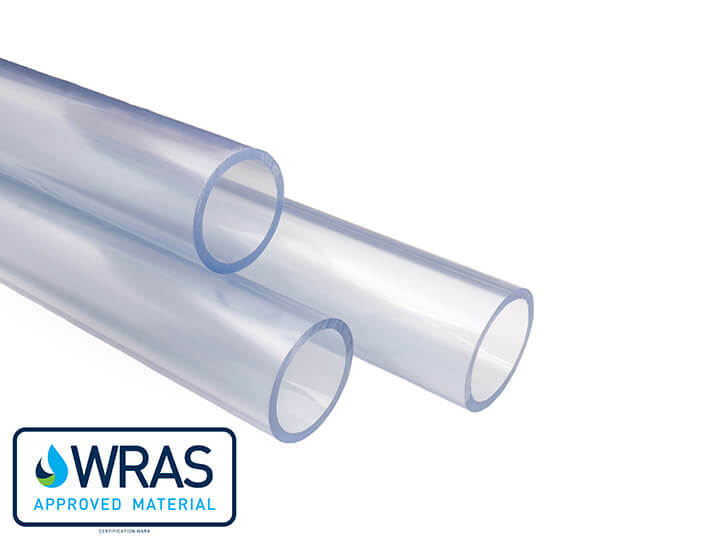 Clear pipe is typically used for sight glasses, process viewing and demonstration units. Pipe Delivery to Residential Address? To avoid bringing a huge truck to your house, pipe for residential addresses will be cut into equal shorter lengths of less than 1.25m. If you would prefer your pipe in full lengths, please tick the relevant box (£7 surcharge) at the checkout. "EVICLEAR" rigid pipe/tube made of schedule 40 Grade PVC (U-PVC/PVC-U). Can be fitted using our clear sockets and fittings either dry, or sealed for liquid, with a solvent cement. Also compatible with standard grey inch sized UPVC fittings .